Clara Mary lights an oil lamp in herone-room shack, revealing a 14-inch colour TV sitting on a blue plastic chairthat she hasn’t been able to turn on since the Tamil Nadu government gave it toher three years ago. “I don’t have any electricity, so I don’t know what to do with thesethings," Mary, a forty-year-old mother of four, said from the slum insouthern India, where naked children played in garbage next to rats meanderingthrough raw sewage. “We just want basic amenities. We don’t want anyluxuries." “It’s allabout instant gratification, and the voters are as culpable as the politiciansin all of this," said M.R. Venkatesh, a Chennai-based independent analystwho has written a book about Indian politics. “If you have to give everyoneclean drinking water and schooling, it’s not going to happen in an instant,whereas if I give you a fan, then it’s easier." India’s subsidy bill rose five-fold in thepast decade under Prime Minister Manmohan Singh’s ruling Congress party toRs2.6 trillion ($43 billion) a year. In the same period, the Indian economy hasonly doubled in size, according to the International Monetary Fund (IMF). Polls show Modi’s BJP winning the mostseats while falling short of a majority, which would make him reliant onregional parties such as AIADMK to form a government. The BJP, while saying itwill continue the world’s largest food programme providing cheap grain for thepoor, said in its manifesto that it would strictly implement fiscal discipline. 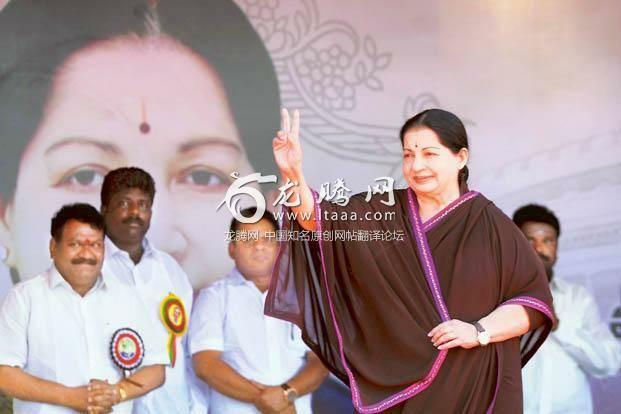 The AIADMK is projecting its leader, formerfilm actress J. Jayalalithaa, as a future prime minister. Campaign posters inthe state depict world leaders such as President Barack Obama and Sri Lanka PresidentMahinda Rajapaksa bowing down to her. Every poor Indian household would get fourgoats, a cow, solar panels and cable television if the party takes power. Poorwomen will get electric blenders, fans and 4 grams of gold if they are gettingmarried. “These are important welfare programmes because people at the lowerrungs of society cannot afford these things," said B.V. Ramanaa, an AIADMKleader and the state’s minister for revenue. Rural families spend longs daysworking hard in the fields. After work they need some comfort. The AIADMK is forecast to win as many as 21of Tamil Nadu’s 39 seats, making it the fourth-biggest party in the 543-memberparliament, according to an opinion poll published this month by CNN-IBN. TheBJP and its allies would win as many as 246 seats, short of the 272 needed fora majority, it said. S. Subramaniam Balaji, a Chennai-basedlawyer, petitioned Election Commission of India (EC) and Indian courts to stopthe giveaways. “The handouts constitute bribes and are illegal because theIndian constitution says government spending must be for the public, notindividuals," he said. “The government doesn’t have an infinite amount of money,"Balaji said in an interview in Chennai, formerly known as Madras. “If we arespending on these programmes, we are neglecting far more important areas."